Rose-filled activities galore to celebrate Valentine’s Day. Rose-shaped memos, stickers, educa-decorate, activity sheets, word flashcards, puppets, coloring pages, and so much more! 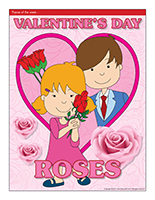 (Open stickers-Valentine's Day-Roses) Print the illustrations on adhesive paper and use them to create stickers that can be given to children to reward them for good behavior. 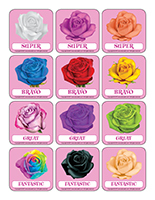 (Open educa-theme-Valentine's Day-Roses) Print and laminate the elements representing your theme. Use them to present your theme to children (and their parents) while decorating your daycare. (Open educa-decorate-Valentine's Day-Roses) Print, laminate, and cut out the items. Use them to decorate the walls of your daycare and set the mood for your theme. 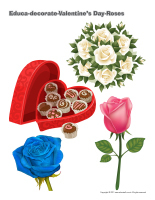 (Open models-Valentine's Day-Roses) Print the models and invite children to decorate them. Cut them out and hang them within your daycare to form a garland. Create a special wall for the duration of your theme. Display several rose bouquets. 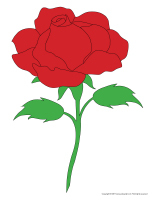 (Open educa-decorate-Valentine's Day-Roses) Print, cut out, and laminate. This wall will set the mood for your theme. Trace the outline of a giant vase on cardboard and cut it out. Add it to your wall. 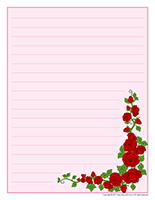 (Open rose-shaped memos) Encourage parents to add to your wall. They can use the roses to write messages for their child. This activity can last all week long. Children can pick kind words for their friends and display them on the wall too. Examples of kind words: nice, kind, smart, happy, adorable, cute, pretty, charming, silly, sweet, great, respectful, fun, magnificent, thoughtful, amazing, friendly, marvelous, etc. Have children draw roses on cardboard and cut them out. Hang a clothesline within your daycare and provide red or pink clothespins children can use to hang the roses. They can add to your clothesline throughout the theme. Hang several roses from the ceiling in your daycare using different lengths of string. This tool was created in response to a special request received. (Open attendance chart) Print and laminate. Use it daily to keep track of who is present and absent. As children arrive in the morning, use a red makeup pencil to draw a rose on their cheek. Serve each child a red or pink cocktail in a pretty paper cup with roses on it. The picture game may be used as a memory game or to spark a conversation with the group. The pictures may also be used simply to decorate the daycare or a specific thematic corner. (Open picture game-Valentine's Day-Roses) Print and laminate. Store the game in a "Ziploc" bag or in your thematic bin. 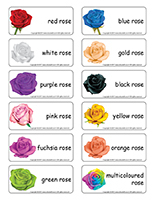 (Open writing activities-R like rose) Print for each child or laminate for use with a dry-erase marker. (Open stationery-Valentine's Day-Roses) Print. Use the stationery to communicate with parents, in your writing area, or even to identify your thematic bins. 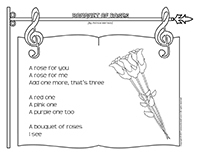 (Open educa-nuudles-Valentine's Day-Roses) Print for each child. Have children color the sheet and use Magic Nuudles to give it a three-dimensional look. If you don't have Magic Nuudles, simply ask children to fill the spaces with bingo markers or stickers. To order Magic Nuudles. (Open word flashcards-Valentine's Day-Roses) (Open giant word flashcards-Valentine's Day-Roses) Print and laminate the word flashcards. Have each child pick a word. They can take turns presenting their word to the group (example: red rose). As a group, name the different colors. Ask children questions to encourage them to talk. (Open word flashcards-Valentine's Day-Roses) (Open giant word flashcards-Valentine's Day-Roses) Print many copies of the word flashcards and encourage children to use scrabble tiles to write the words. Manipulating the small tiles represents a great fine motor skill exercise. At the same time, children will notice which letters make up the different words. (Open word flashcards-Valentine's Day-Roses) (Open giant word flashcards-Valentine's Day-Roses) Print two copies of several different word flashcards. On a large piece of cardboard, stick one copy of each flashcard vertically to create a word column. Cut the second copy of each word flashcard so you have the word on one side and the illustration on the other side. Attach Velcro behind each part as well as to the right of the uncut flashcards (on the cardboard). Arrange the cut flashcards on the table and encourage children to look at your flashcard board to identify a matching word and illustration. When they succeed, they may stick them next to the corresponding flashcard, on your board. This exercise will help children associate words with pictures. (Open word flashcards-Valentine's Day-Roses) (Open giant word flashcards-Valentine's Day-Roses) Print several word flashcards. Use a hole-punch to make a hole at the top of each flashcard. Thread a ribbon through each hole and tie a knot. Bring the word flashcards outside and encourage children to use them to decorate a tree. Every time a child adds a flashcard, invite him/her to "read" the corresponding word. Children will be happy to repeat this activity many times. Eventually, they will learn to recognize the words. (Open word flashcards-Valentine's Day-Roses) (Open giant word flashcards-Valentine's Day-Roses) Print two copies of several word flashcards. Hang one copy of each word on an indoor clothesline with colourful clothespins. Arrange the copies in a pile on a table. Let children take turns picking a word and finding the matching word on the clothesline. When they find a match, they can place the flashcard on top of the one that was already hanging on the clothesline. Help younger children manipulate the clothespins if necessary. (Open word flashcards-Valentine's Day-Roses) (Open giant word flashcards-Valentine's Day-Roses) Print several word flashcards and hide them throughout your daycare or yard. Divide your group into two teams. When you give them the signal, children must search for the flashcards for a pre-determined period, for example three minutes. When the time is up, children must be able to "read" their flashcards to earn a point for their team. If they are unable to find the correct word, the other team can earn the point if its members succeed. 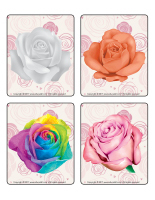 (Open scene-Valentine's Day-Roses) Print, laminate, and cut out the various pieces. Children can use them to create various scenes. Fill several clear containers with pink objects, confetti, ribbons, etc. Add tiny bells that will produce interesting sounds when children explore the bottles. Use fabric roses or other objects or illustrations related to the theme to create a mobile. Simply hang them from the ceiling over your changing table. 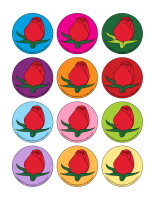 (Open transition games-Valentine's Day-Roses) Print each illustration twice. Use adhesive paper to secure one copy of each illustration on the table. Deposit the second copy of each illustration in an opaque bag and invite children to pick a card that will determine their spot at the table (corresponding illustration). The illustrations can also be used to determine children's naptime spots or their place in the task train. 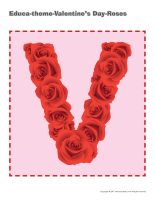 (Open transition games-Valentine's Day-Roses) Print, laminate, and use adhesive paper to stick the illustrations on the floor, creating a path that leads to various areas frequently visited by the children in your group (bathroom, cloakroom, etc.). If you prefer, you can also use the illustrations to delimit workshops or corners within your daycare. 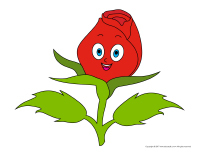 The Educatall.com team has prepared a special rose-filled week for Valentine's Day. Each day, you will find different activities to enjoy with your group. You can pick and choose among the suggested activities or adapt them to suit the needs of your group. 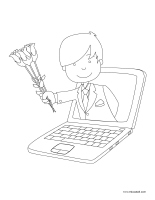 (Open educ-trace-Valentine's Day-Roses) Print for each child. Children must trace the lines using a crayon of the corresponding color and then color the item at the end of each line using the same color. (Educa-symmetry-Valentine's Day-Roses) Print. Children must color the picture on the bottom to make it look exactly like the picture on the top. (Open educ-pairs-Valentine's Day-Roses) Print. Children must draw a line between items that go together or color them using the same color. (Open educ-intruder-Valentine's Day-Roses) Print and laminate. Children must find the six items. 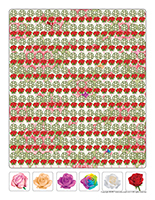 (Open color by number-Valentine's Day-Roses) Print for each child. Children must color the picture according to the color code. (Open word flashcards-Valentine's Day-Roses) (Open giant word flashcards-Valentine's Day-Roses) Print several word flashcards. Cut them out and glue each one on a piece of paper. Laminate them. Arrange the words in a binder and provide a dry-erase marker children can use to trace the words. Older children will enjoy trying to write the words independently below the flashcards. Purchase or collect several spray bottles. Pour a mixture of water and food coloring in each bottle and invite children to use them to draw roses in the snow. Children will love watching the snow change color. If you do not wish to use food coloring (it can stain clothing), you can also remove the felts from old markers and let them sit in the water-filled bottles overnight. Kool-Aid powder can also be used. Children will appreciate the fruity scent when they spray the mixture on the snow. If the snow has already melted where you live, provide sidewalk chalk children can use to draw roses in your yard or on sidewalks. Ask around to find a large red or pink bedsheet. Gather your group around the bedsheet and set several plastic roses on top of it. Invite children to vigorously shake the bedsheet to make the roses fly up high in the air. If you prefer, you may also use your parachute. Variations: Instead of plastic roses, use balls of tissue paper, fabric flowers, balloons, or hearts cut out of construction paper. This activity can also be done outside. Inflate four or five pink balloons. Tell children they must never touch the floor. If you wish, you may also give them more complicated instructions. For example, you can tell them they may not touch the balloons with their hands, that they must blow on them, etc. Where is my rose hiding? Draw tiny roses on pink Post-its. Stick them on various surfaces within your daycare and let children discover them throughout the day. This activity can even last all week. You can stick roses in your bathroom, in the cloakroom, on children's utensils, etc. Cut rose outlines out of cardboard. Attach a paperclip to each one and invite children to fish for roses using a toy fishing rod with a magnet at the end of the string. Fill a small pool or containers with snow and hide objects inside. When you give the signal, children must dig out an object. Every time they find one, have them set it in another container before returning to find another one. Once all the objects have been found, hide them again. This is the arts & crafts day of the week. Many crafts are possible. Use your own ideas or the ones suggested here depending on the abilities and interests of the children in your group. Draw a rose on a black piece of construction paper for each child. Let them apply glue inside their rose outline. Have them crumple pieces of red, pink, and white tissue paper and press them in the glue. Press rose-shaped cookie cutters in glue and then on paper. Sprinkle the roses with glitter. Shake off any excess glitter over a garbage can or bin. (Open models-Valentine's Day-Roses) Print for each child. Fill the shapes with glue and stick white, red, or pink rice (previously dyed) all over. Here is a simple recipe to dye rice: Combine 1 pint of rice, 2 tablespoons of food coloring, and 3 tablespoons of rubbing alcohol. This preparation must be done by an adult. Not for consumption. Cut two identical rose shapes out of waxed paper. Mix corn syrup and red food coloring together. 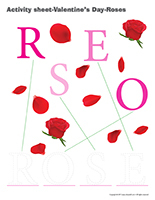 Use the mixture to paint one rose shape and press the second rose shape on top. Let dry and hang within your daycare. Cut rose shapes out of pink paper. Cut a slit at the bottom of each rose and insert a drinking straw that will represent its stem. Make glasses that children will like to wear to see pink everywhere! For each child, cut out the bottom of two Minigo containers. Glue a red acetate sheet on each one. Punch a tiny hole on the outside of each container and thread a pipe cleaner through. Children can set them on their ears to wear their pink sunglasses. Use a cut pipe cleaner to hold both containers together in the centre. (Open puppets-Valentine's Day-Roses) Print the models on heavy paper. Have children cut them out and decorate them with a variety of arts & crafts materials. Stick a Popsicle stick behind each one to complete your puppets. (Open models-Valentine's Day-Roses) Print the models. Use them for your various activities and creations throughout the theme. This is the music-filled day of the week. Many games and activities are possible. You will find a few suggestions here. Do not hesitate to create your own, using them for inspiration. Cut several different shapes out of pink construction paper and use adhesive paper to secure them on the floor throughout your daycare. Play soft music and invite children to waltz around the daycare. When the music stops, they must find a pink shape to stand on. Divide your group into two teams. Have each team sit at a table. Set a large piece of paper and a single pink crayon on each table. Play music. One child from each team begins drawing on his/her team's paper. When the music stops, the child hands the crayon to another child who must continue the drawing. Variation: You may also choose to provide pink paper and a dark marker for each team. Play musical drawing with your group. Give each child a coloring page. Have them sit in a circle. When the music plays, children pass the coloring pages around the circle. When the music stops, they must color the picture in front of them. When the music starts again, they resume passing the coloring pages around the table and so on. Treasure hunts are always popular. In general, simple treasure hunts are the best. Here are a few ideas to enjoy with your group. 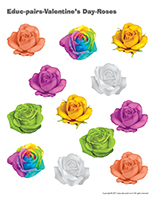 (Open miniature roses) Print and laminate. Hide the roses within your daycare and ask children to search for them. The child who finds the most roses can hide them for the next round. Cut several roses out of construction paper and hide them within your daycare. Encourage children to search for them and stick them on a giant vase displayed on a daycare wall using adhesive putty. Cut several roses out of colourful paper and then cut each one in two. Use adhesive putty to glue half of each rose on the wall and hide the other halves. Children must search for the cut roses and associate the ones they find to the correct roses on the wall. Hide plastic roses in your yard. Have children dig them out of the snow. Count the roses with your group. During naptime, hide rose-shaped chocolates throughout your daycare. Children will love finding (and eating) them. 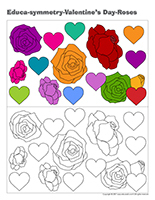 (Open coloring pages theme-Valentine's Day-Roses) Print for each child. Discover different ways to use the coloring pages. 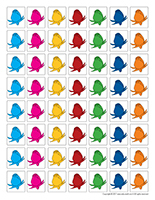 Print the same coloring page for each child and an additional copy for your model. Color only certain parts of your picture. Present the model to your group and ask them to color their picture to make it look exactly like yours. Print and laminate several coloring pages and arrange them in a binder with a few dry-erase markers. Leave everything on a table for children to explore. Play musical drawing with your group. Give each child a coloring page. Have children sit around a table. When the music starts, they must pass the coloring pages around the table. Every time the music stops, they must color the picture in front of them until the music starts again. Give each child a picture to color. When they are done, cut each picture into pieces to create unique puzzles.